There is a quite long list of small new features and improvements that got implemented in January, but I managed to group most of them under three major ones: Battle setup screen, battle editor and ship health monitoring. These are shown and explained in the video below. As promised, this monthly update video now features a voice over track instead of captions. The new battle setup screen can be currently used to quickly and easily set up a skirmish battle between two fleets. It is focused on adding ships to fleets, and comparing their statistics, but still provides some simple battle settings such as presets for level and deployment area sizes. However, these are all functionality that could be achieved with the battle editor as well, so why create this screen while I should be concentrating on getting the game to a playable state? The thing is that the battle setup screen will be used with challenges and levels created with the battle scenario editor. It actually has 3 modes that limit the options for the player: Free skirmish allows changing all battle settings and both fleets, fixed enemy fleet doesn't allow editing the enemy fleet, and fleet creation challenge only allows the player to create his own fleet within a set budget. These challenge levels could then have highscores and be shared online at some point. The battle setup screen with all UI elements open. 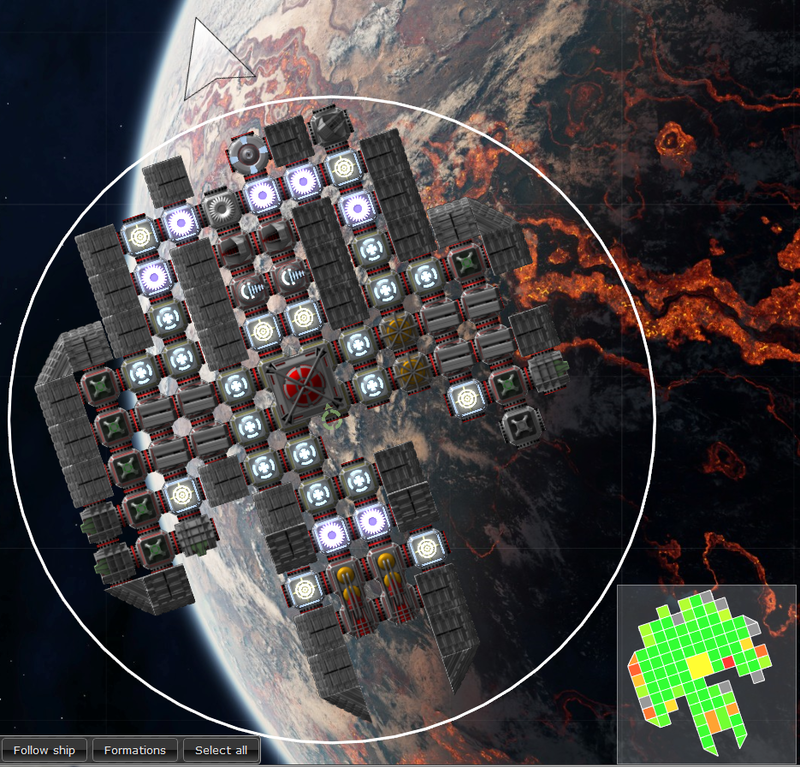 The battle scenario editor is practically a level editor that can be used to set up battles between two fleets. 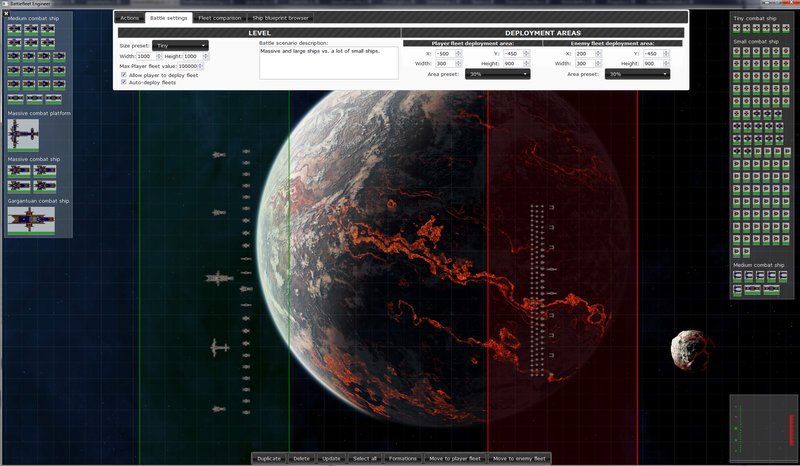 It is meant to be a tool used for creating skirmish battle challenges, and allows free positioning of the ships in both fleets, editing the level parameters, and setting challenge parameters such as player fleet budget. The level editing tools and options will be expanded when new level features such as asteroids and other debris gets implemented. One limiting factor with the editor is that it doesn't actually load or save the full level state data structures. This means that the output is much smaller and faster to process, but all ships in the battles will have full health as they are saved as blueprints. It does limit what kind of scenarios can be done, and might also mean that a separate full level editor may be needed, or the functionality expanded to have an option to save either the full state like a battle save game, or just the information that can be preserved in the challenge format. 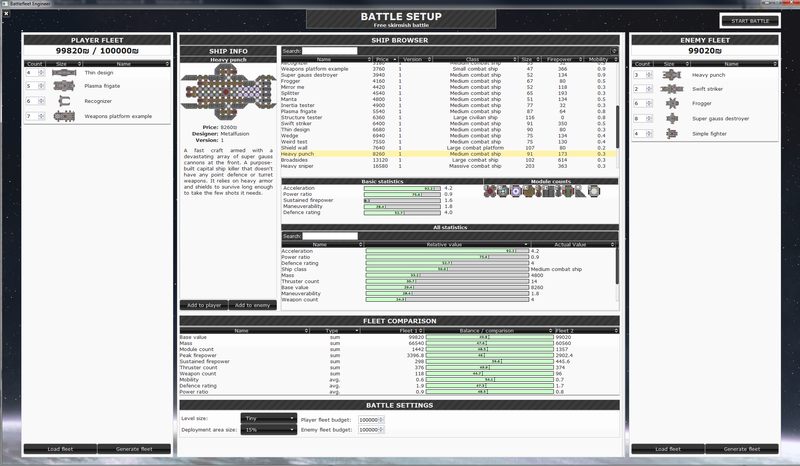 The battle scenario editor with battle settings tab open. Since I don't have any visual indication of module states implemented (other than disabled modules shown as grayscale), it can be difficult to make tactical decisions like when to pull a ship to the back before it gets destroyed. To fix this information deficit, I have now implemented three new ways to monitor the health of your ships during battle. First addition is the ship state map widget, shown next to the minimap in battle mode, which gives an easily readable real-time indication of each module's health in the selected ship. The modules' collision shapes are drawn with colors ranging from bright green to red. In addition, gray is used to indicate disabled modules. For quick examination of the whole fleet's state, there are now two health bars for each ship in the fleet tree view / listing shown on the left edge of the screen. 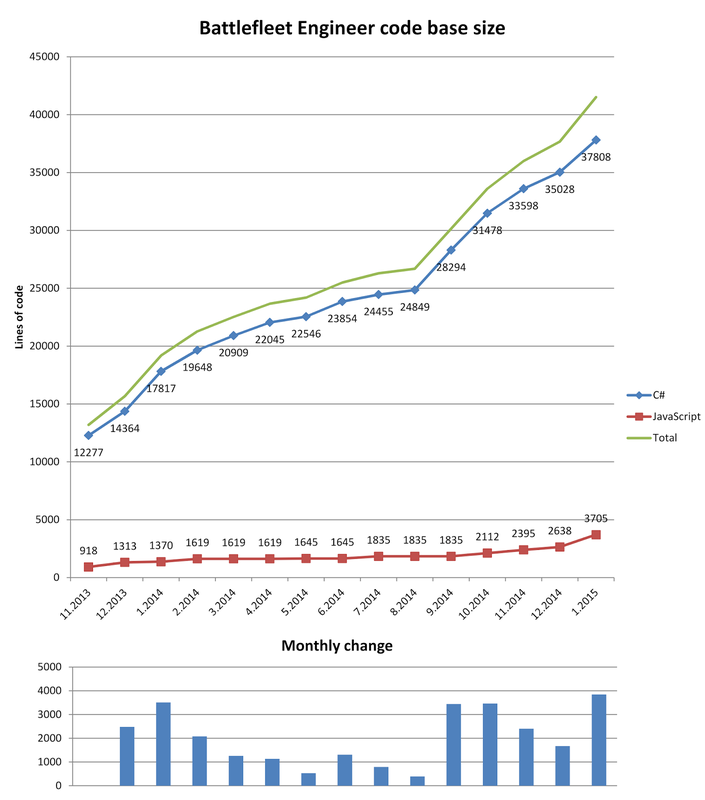 These bars indicate the overall state of the ship, calculated from various health parameters of each module, and the state of defensive capabilities such as armor and shields. For more accurate information and keeping an eye on particular ships, it is now also possible to open separate state information pop-ups that show the health map and 6 different statistics. I have mentioned before that I will be trying to get the game to "a basic playable state" on Q1 of 2015, and maybe have indicated that it would then be ready for early-access release. I must now say that this does not seem realistic. While I can probably push the game to a bare minimum state where it could be distributed, I don't feel it could be justified to sell the game in such a feature-lacking state. However, I now have plans to start a very limited pre-alpha core gameplay play testing with a small group (less than 10) during the next couple of months. The focus on this testing will be to evaluate the already implemented gameplay mechanics and do the final decisions what to concentrate on. These testers will have significant influence to the game design decisions, but will not be compensated nor need to pay to take part. I hope I can find some motivated individuals to help me make this game the best it can be. This 'program' will be formally announced later. During February I will be focusing on implementing a couple of new modules (heat radiator/storage, shields), and necessary utilities such as options menu, difficulty settings etc.